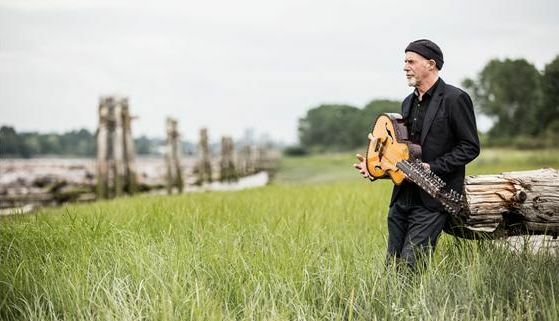 Harry Manx speaks to the soul with his calm spirituality and distinctive sound. Dubbed the essential link between the music of East and West, he is a master of the musical short story that seamlessly weds the tradition of the ‘earthly’ American Blues with the depth of classical ‘heavenly’ Indian ragas. A dedicated performer and prolific artist, he has released fourteen CDs, including the recent Faith Lift, garnered a serious stack of awards and toured extensively across Canada, the US, Australia and Europe, playing in soft seat theatres, prestigious festivals and first-rate blues clubs. Whether playing the Mohan Veena (a 20-string sitar/guitar hybrid), lap steel, harmonica, stomp box, dobro, banjo or cigar-box guitar, Manx draws audiences in to ‘the Harry Zone”—a meditative introspective place—and then pulls them back to ‘now’ when he moves to more Western music His signature “mysticssippi” style … a blend of Indian folk melodies and slide guitar blues, with a sprinkling of gospel, distinctive hypnotic vocals and poetic lyrics … is a well-tested recipe that goes down easy and leaves listeners hungry for more.